Which Plant-Based Protein Bar Will Reign Supreme? 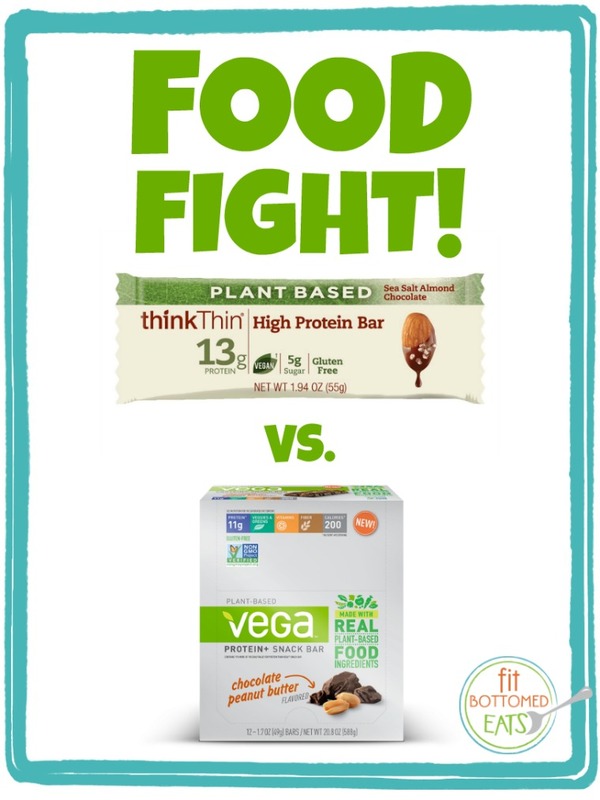 Which is exactly why this Food Fight pits two new plant-based protein bars head to head: thinkThin Plant Based High Protein Bar and Vega Protein+ Snack Bar. thinkThin Plant Based High Protein Bar: Both the Salt Almond Chocolate and Chocolate Mint flavors are really chalky and dry. They almost make you want to reach for water (so, maybe a bonus if you want to up your hydration? ), they’re so dry. Flavor-wise, the Chocolate Mint is definitely the better of the two — although both leave a bit of a sugar-alcohol aftertaste. 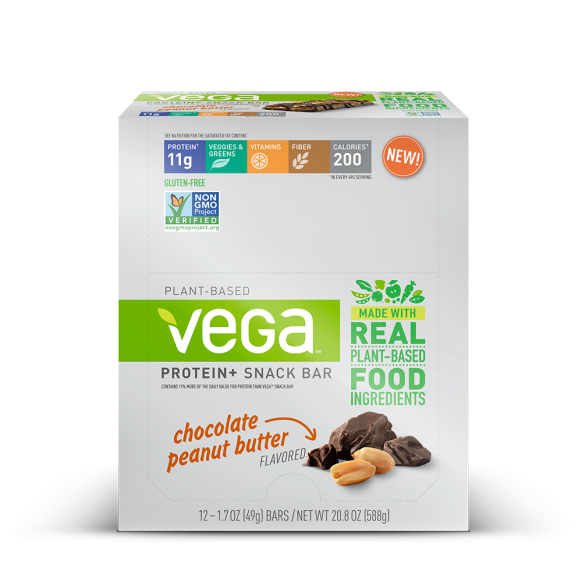 Vega Protein+ Snack Bar: A little chewy and a little crunchy, the Chocolate Peanut Butter flavor is straight-up delicious — like dessert. The Chocolate Caramel is a bit more understated … and, well, less like dessert and more like a protein bar (although if you prefer your protein bars not too sweet, you could probably dig it). Winner: This one easily goes to Vega, especially the Chocolate Peanut Butter flavor! thinkThin Plant Based High Protein Bar: Each bar has 230 calories, 13 grams of protein, 8 grams of fat (3 saturated) and 5 grams of total sugar (there are 18 sugar alcohol grams, hence the aftertaste). You’ll also get 6 percent of your calcium for the day, plus 15 percent of your iron and 4 percent of your potassium. Vega Protein+ Snack Bar: Each bar has 200 calories, 11 grams of protein, 9 grams of fat (4.5 saturated) and 12 grams of sugar. You’ll also get about 10 to 25 percent of a lot of your major vitamins and minerals including vitamin A, C, D, E, K, B6, B12, folate and iron (plus lots others). Winner: Although we like that thinkThin has more protein and less (total) sugar, we’ve got to give it to Vega for the fewer calories, more natural sugar, and extra vitamins and minerals. thinkThin Plant Based High Protein Bar: Vegan, gluten-free, GMO-free and with no soy ingredients, the protein in these bars comes from a protein blend of peas, brown rice and pumpkin. Vega Protein+ Snack Bar: Also, vegan, gluten-free, GMO-free and with no soy ingredients, the protein in the Vega bars come from peas and brown rice. In addition, you’ll see a looong list of really healthy added ingredients such as: kale, algae, alfalfa grass, blueberry, orange peel and beet … just to name a few. Winner: Seeing a trend here? We’re going with Vega! Taking three out of three categories, the Vega Protein+ Snack Bar takes the plant-based protein bar crown hands down! I mean, we’d totally eat one of those thinkThin Plant Based High Protein Bars over a lot of others out there, but if Vega was there, too, we’d reach for Vega every time.